This A Touch of Evil review was made after playing the game about 10 times. What is A Touch of Evil? 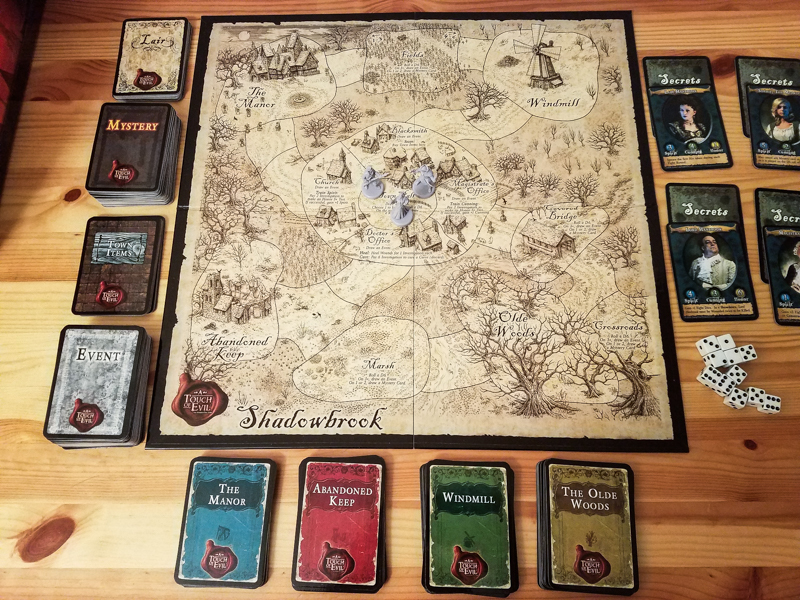 A Touch of Evil is an adventure game set in the fictional town of Shadowbrook where multiple heroes are attempting to defeat a terrible villain that is trying to take over the town. The game was designed to be a competitive game (one player kills the villain for all the glory), but it also has a fully cooperative mode as well as a competitive team mode. 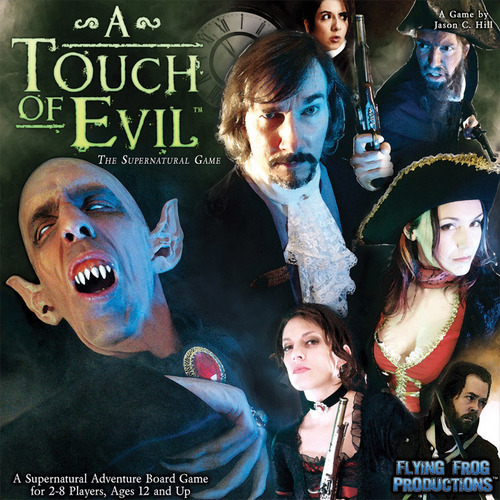 A Touch of Evil was designed by Jason C. Hill and is published by Flying Frog Productions. 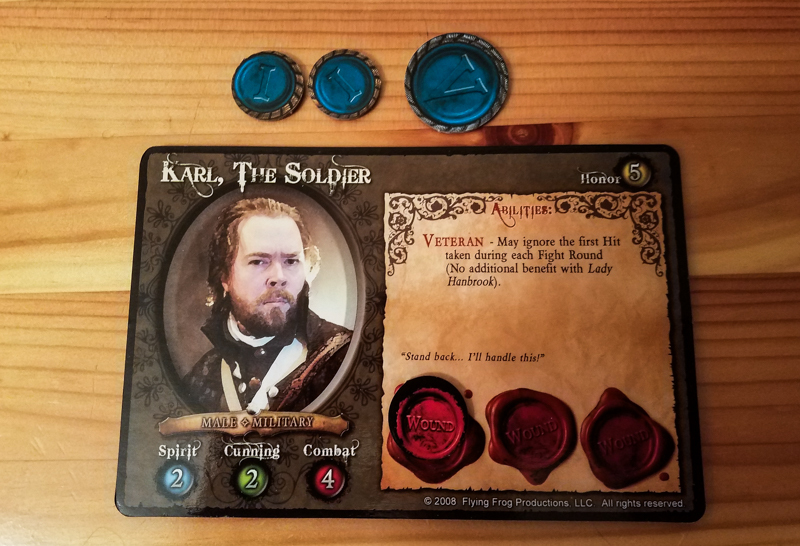 In every game of A Touch of Evil, players are going to collectively or randomly choose one of the four villains to face and then choose their own heroes. The characters have unique abilities that they can use throughout the game, and the villains have abilities that affect the game in different ways and minions that they can summon. On their turns, players roll a die to see how far they can move, then they take one or more actions. The actions include encountering the space they’re on (mandatory), collecting investigation tokens on their space, healing wounds, investigating a Town Elder, buying a Lair card, and fighting the villain. The main action you’ll be taking each turn is “encountering the space.” You do this by either drawing a card from that location’s deck (the four corner locations) or by performing the action written on the location’s space on the board. The location cards and the Event cards can make you better at certain skills or they can give you one-off abilities that can help you stay alive. If you ever move to a location that has a minion on it, you have to immediately fight that enemy. Fighting is very simple: you roll a certain amount of dice depending on your combat skill and then roll the minion’s dice. Fighting happens simultaneously, so both you and the minion could take wounds during the same fight round. The fight continues until the minion is killed, your hero is knocked out, or you decide to escape. If the hero is knocked out, they will usually heal up before their next turn, though they will lose some items. Investigation tokens are the currency in the game. 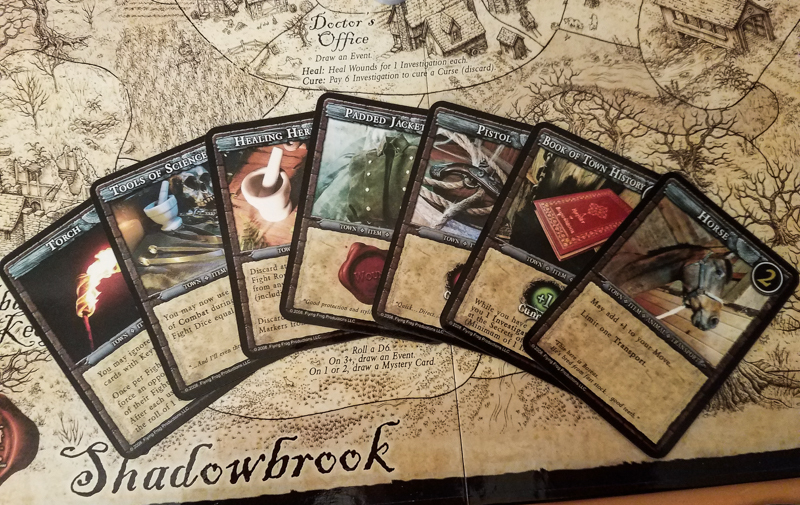 They help you to heal, to buy the Town Item cards that can give you special abilities, to look at a Town Elder’s secrets, and to buy the Lair cards. The Town Elders have their own unique abilities and they each have a Secret card underneath them. These secrets could mean very little to you, they could give you extra abilities in fights with the villain, or they could even be secretly on the villain’s side. In co-op mode, the secrets are revealed for everyone to see, while in the competitive game the non-evil secrets are kept hidden. If an elder is found to be evil, they are immediately revealed and they are placed next to the villain, giving it better combat stats in fights. After all of the players have taken their turns, the Mystery phase begins. In competitive mode, you simply draw a Mystery card and see what type of action the villain has taken. In co-op mode, you will first roll a die and compare the result to the Mystery Phase Chart on the back of the rulebook, and then you’ll draw a Mystery card. Also, this is the phase where the villain gets to heal up a little bit and where knocked out heroes are revived. 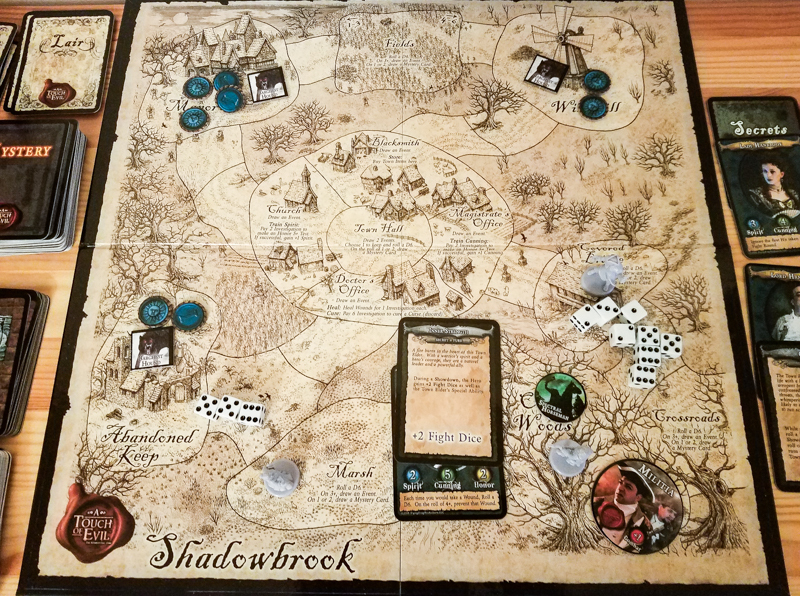 The Shadow Track helps you keep track of how close the villain is to taking over the town as well as the current Lair card price. As the villain gains more influence over the town, the Lair cards become cheaper since he is more visible to the heroes. If the tracker ever reaches zero, the villain takes over the town and all of the heroes lose (this is true in every game mode). The Lair cards are very important in this game because they tell you where the villain currently is and you use these cards to trigger the “Showdown” with the villain. Once you have bought a Lair card and have moved to that location, you can decide to fight the villain rather than taking any other actions. 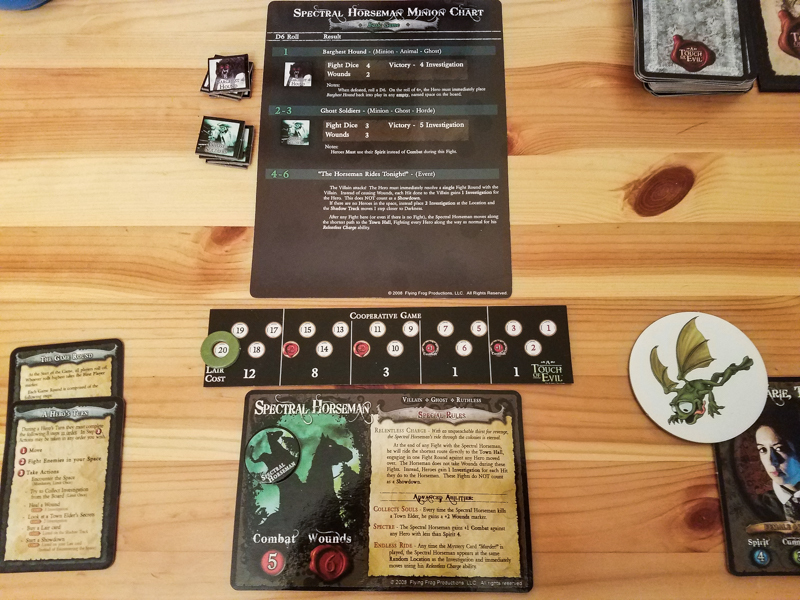 In co-op mode, any other player can join the fight if they have enough investigation tokens to pay the cost shown on the Lair card. You can choose to take one or more Town Elders with you to the fight, which gives you those extra stats and abilities. These fights are exactly like the fights with minions, though the villain will always use one of its dice on each of the Town Elders in play. In the cooperative game, all players win if the villain is defeated. In the competitive game, the player who deals the final blow is the winner. I really like the way the Town Elders work. You run the risk of giving the villain more power by checking their “secrets,” but it’s usually worth the risk because they could also give you extra abilities when it comes time to fight the villain. They work well in all game modes, but they’re especially great in the competitive modes because you don’t have to reveal what you’ve seen. Each villain gives you a unique gaming experience. Sometimes they’ll show up in town when you draw a specific card, or they might even be weak to certain types of cards. Each one makes you approach the game in different ways. My group loves the look of A Touch of Evil. I don’t think the portraits look great on the box cover and the rulebook, but they do look great on the cards. Plus, everything has this nice glossy finish, which makes it look and feel like a higher quality game than most people would probably expect. The designer clearly put a lot of work into making sure the theme shined through in this game. Most of the cards have some flavor text to tell you what you ran into in town, and the characters themselves have backstories and abilities that make sense. Plus, it’s an original theme, which makes the whole production that much more impressive. A Touch of Evil is surprisingly easy to learn and teach. Sure, co-op mode throws in a few more rules and you’ll need to keep the villain’s special rules in mind as you play, but for the most part it’s a pretty smooth gaming experience for people of all experience levels. Flying Frog Productions put out a lot of expansions for A Touch of Evil, which add in more characters and more challenges for fans of the game. There is a ton of randomness in this game. You’re rolling to move, you’re rolling to fight, you’re rolling for other tests, and you never know what you’re going to draw from the decks of cards. The game runs pretty long at higher player counts. There’s really no way to make it quicker, either, since you’ll usually discuss what everyone should do and each player has to roll, move, and take an action of some kind. Plus, it can take a while to gather all of the investigation tokens you’ll need to face the villain. Unless you’re playing the team game, I wouldn’t recommend playing with more than five. If you roll pretty well, the game can get pretty boring. This is especially true in co-op mode. During some of my group’s games we were just waiting for someone to get enough investigation tokens to be able to afford a Lair card and attempt to take down the villain. It’s not a good sign when you’re almost hoping some people roll poorly so the game is more of a challenge. High luck-based games like A Touch of Evil aren’t usually hits with my group, but most of us really like this original theme and we’ve had plenty of “Wahoo! !” moments while playing. Sure, some games are more entertaining than others, but for the most part we’ve had a good time when this has hit the table. It’s not necessarily a “keeper” for my group, but I think most of us would be happy to play it if someone brought it out. A Touch of Evil isn’t for everyone. If this theme does nothing for you, I don’t think you should get it since there’s really nothing new here mechanically. If you don’t like a ton of dice rolling in your games, definitely pass on this one. Also, if you know you’d never play it competitively, I don’t know that co-op mode has the replayability to make it worth your money. If you do like this B movie horror theme, chances are you’re going to enjoy playing A Touch of Evil. This is also a good choice for people who want a shorter, simpler version of Arkham Horror (I actually like this a bit more than Arkham Horror). Oh, and a lot of people will love the idea of having a game with a bunch of different game modes in the box. Thanks for taking the time to read our A Touch of Evil review! To stay updated on all things cooperative board games, follow us on Twitter, Facebook, or via RSS.